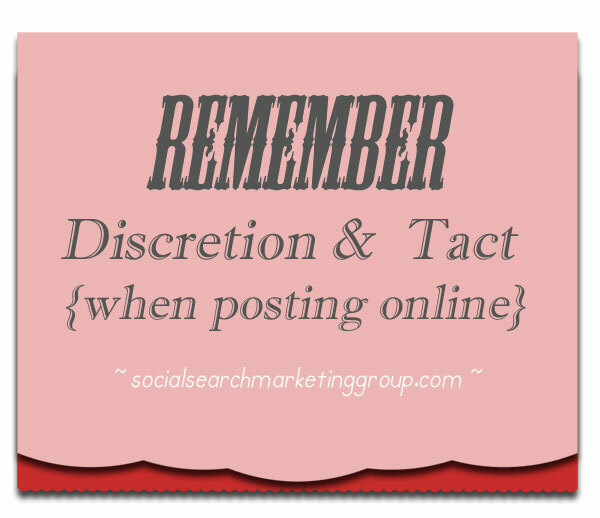 Did you know that your social media posts are discoverable? With the increase of social media media usage, lawyers are also mining data from the internet to build their cases. The following is from a lawyer that I know very well. In fact, I am related to this lawyer. He works for one of the biggest workers compensation insurance companies in California. He used what he has gathered from the internet a couple of times, and won his cases. I often call him as honest lawyer. I know that is an oxymoron for people in that profession but this one is “it.” In fact, I have met people in that conference from the other side (defendants) who came up to him and acknowledged him for being so. As a workers’ compensation attorney in California, I can tell you that if you file a claim for job injury your social media activity may be discovered by the administrator of your claim. Discovery is the legal term for the process of gathering information relevant to a legal claim. When using social media and the internet it may be referred as e-discovery or electronic discovery. In most instances discovery, is interpreted broadly by the Court, unless there is a sensitive medical condition like AIDS or psychiatric injury. There is a Constitutional right to privacy through both our Federal and State Constitutions. However, if you file a lawsuit or workers’ compensation claim, you have given up or waived some of your rights to privacy. If your Facebook privacy has been set to “Public” you can expect those posts to be discoverable by the defendant (your adversary). Okay. But, what if your posts’ setting is set to “Friends” only on Facebook instead of “Public”? Remember how filing a lawsuit means you may have waived rights to privacy? If the posts, images, and videos are relevant to an issue in your lawsuit or case, you may not be able to hide them from the insurance company, opposing lawyers, or judge. They may be admitted into evidence or may lead to other evidences that may be evidence in your claim or lawsuit. A recent trend by some attorneys is to have their client help their case by posting information to help prove their case. Be very careful on this. If a person intentionally misleads someone to get benefits, there may be criminal punishment. So blog, post, photo, and video in a responsible manner. Ask for legal advice from your attorney. And legally, be aware that you cannot expect social media privacy settings to keep embarrassing or damaging information from surfacing in your lawsuit or workers’ compensation claim. Disclaimer: This information is not to be considered as legal advice. 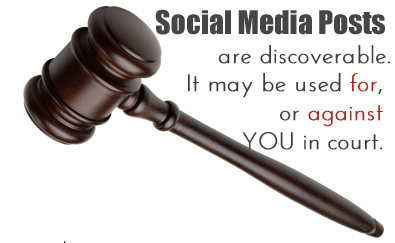 Consult an attorney for questions about legal issues involving social media.